The licensed and insured roofers that Newcastle Roofing Professionals provide are committed to permanently repairing any problem with your roof and are able to travel to your location anywhere in Newcastle or the surrounding region. We have regular service throughout a large area of NSW and are able to provide roofing services throughout Newcastle, Maitland, Lake Macquarie, the Central Coast, the Hunter Valley, and surrounding areas. The options and procedures for roof repairs vary depending on the extent of the problems to be addressed. Listed below are a range of roofing services that can be provided to comprehensively ensure your roof is trouble free. Roof repairs with Newcastle Roofing Professionals start with the assessment process. An inspection of your roof can be booked at any time by calling 0427 081 485, and at a time that suits you one of our experienced roofing assessors will arrive at your address. While there they will inspect all aspects of the roof, guttering and surface, and they will provide their professional opinion on the condition of your roof, as well as answer any questions you may have and provide quotations for any required repairs. There are no obligations or expenses in a meeting with one of our assessors and all of their advice is provided totally free of charge. Shortly after your meeting with the assessor, any required roofing repairs or services taking place will be completed by a qualified, experienced, insured tradesman provided by Newcastle Roofing Professionals. If your roof inspection appointment relates to an urgent problem with your roof, we are able to prioritize your job and ensure that emergency roof repairs take place as soon as possible. We work hard to ensure that your roofing repairs are totally stress free - you will be personally notified before assessors and tradespeople arrive at your address, we provide all required materials, clean up meticulously afterwards and use guards to protect your gutters, tiles, paintwork and delicate fixtures on your roof. Expert roof tiling tradesmen will replace any broken or cracked roof tiles to ensure wind, vermin and rain stay out of your roof space. We take extra care on older style roofing and liner to ensure no further damage is done to surrounding fragile roof tiles. Roof Valley iron replacement is a roofing repair process needed when old and rusted galvanized valley irons have reached the end of their lifespans. Valley irons are an integral part of your roof plumbing system, which should be inspected regularly to ensure that no water can enter your roof during severe weather in order to prevent damage to the roof sarking, ceiling gyprock and interior fixtures. Colorbond valley irons can be installed to ensure a longer and trouble-free life, and to match the existing colour of your roof. How about Roof Re-Bedding and Re-Pointing? You Bet! Cracked or loose ridge capping tiles can allow wind and rain into your roof, and also presents the hazard of ridge caps slipping down and causing injury or smashing your brand new car. 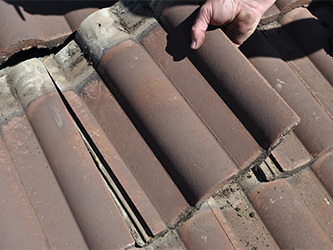 The process of re-bedding and re-pointing your ridge caps is important maintenance required regularly by tiled roof surfaces. We start by removing all of the old unstable bedding cement from under the ridge caps and laying a new batch of cement using a bedding rack to ensure a clean, straight finish. Then we re-point the ridge cap tiles using flexible pointing (see below). Flexi Point is a flexible roof pointing compound and has been formulated using premium quality Rohm and Haas acrylic technology. It has been designed to give superior adhesion, UV resistance and rapid cure. 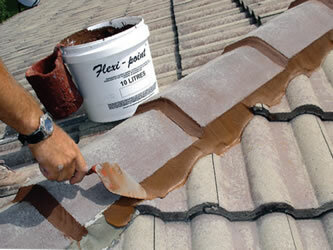 You will find Flexi Point can match the colour of your roof tiles from their vast range of pre mixed colours. It is easily applied and user friendly and is suitable for all types of roofs, new or old. Flexi Point will add strength and security to your roof. Flexi Point is made to meet the highest quality standards as demanded by the Australian Consumers and is built to withstand the tough Australian climate. Flexi Point has achieved and exceeded C.S.I.R.O. Accreditation to C3 wind classification according to Australian Standard AS2050. Flexi Point has been successfully weather tested to Australian Standard Test Method D4587-86. Click here to learn more about Flexi Point. 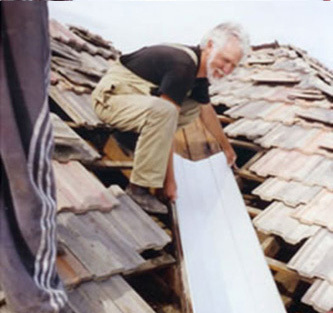 Why is Flexi Point Superior for Roof Repairs? The Australian climate and the Newcastle coastline create severe challenges for the common tile roof installation. Between heavy drenching rains, severe winds, moss and mould, wildlife damage and tree debris, owners must remain roof vigilant. Throughout the local area heavy storms and harsh summers are common, and for this reason we recommend flexi-point for all pointing roof repairs in the Newcastle region. With more than three decades across all categories of roofing experience, Newcastle Roofing Professionals can give you an accurate assessment of your tiled roof. In most situations we can solve your roofing problems where other roofing contractors may have quoted your a more expensive treatment or possibly recommended a total re-roof. We are totally committed to providing excellent expert service and quality roofing craftsmanship. ...and best of all, it comes with a 10 year Manufacturers Guarantee! "Excellent job and done sooner than expected." "I was contacted promptly, advised when they would assess the repair, and given a quote for the repair together with a quote for other recommended repairs. Once I accepted the quote, the repair was done promptly and efficiently. I would recommend Newcastle Roofing Professionals to anyone requiring any type of roof repairs or maintenance." "They were good people, on time, kept in touch by letting me know what was happening, and they did a good job." "I would like to thank you and all the staff involved with fixing my roof. I would not hesitate to recommend your firm to family and friends as I found the guys were friendly and professional. A special thanks to Chris (tiler) who went that little bit further in making sure I would be happy with the job". "The job has been completed and dusted. Newcastle Roofing Professionals turned up when they were supposed to and did the job efficiently. Haven't had problems with it since."